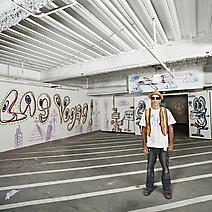 RETNA (AKA Marquis Lewis) was born in 1979 in Los Angeles, CA. Since making his debut in the mid-1990s, RETNA has participated in over 30 international exhibitions with countless works in the public realm. Yielding an unmistakable aesthetic that integrates appropriated contemporary photography, graffiti, traditional painting and a unique glyphic style, he has emerged as one of the most prolific street artists in the contemporary art world. An integral fixture in the Los Angeles art scene since an early age, the transcendent nature of RETNA’s work has allowed him to seamlessly transverse from the unregulated urban landscape to institution galleries across the globe. Merging couture with street culture, the spiritual with the sensual, and fluidity with grit, his paintings provide an exceptional lense through which we view contemporary culture. Recent projects have included a solo exhibition, “Silver Lining”, during Art Basel Miami Beach as part of Primary Flight, the World’s Largest Street Level Mural Installation (2010); a solo exhibition, “Desaturated”, at New Image Art Gallery in Los Angeles (2010); a mural for the Margulies Collection at the Warehouse in Miami, FL (2009); and “Vox Humana”, a survey of legendary street artists by L.A. Art Machine at the Los Angeles Art Show (2010). In 2011, RETNA was featured in the “Art in the Streets” exhibition at MOCA in Los Angeles, on the heels of successful solo exhibitions in both Los Angeles and Miami. He lives and works in Los Angeles.